A police vehicle fitted with both Mirage™ and conventional roof markings. Only the Mirage™ markings are visible in the thermal infrared image. Mirage™ Thermal ID film enables airborne surveillance units to identify emergency services vehicles 24hrs a day, in all weathers. When viewed at night using thermal infrared imaging equipment, police cars with conventional roof markings are indistinguishable from civilian vehicles. Mirage™ is a thermal vehicle marking film that reflects the apparent temperature of the sky back to an observing air support unit allowing the crew to easily identify “friendly vehicles” from target or neutral vehicles. This allows timely direction of ground assets that may mean the difference between success and failure during a high tempo operation. applied to the roof bar. Mirage™ is specifically recommended for use on all UK Police vehicles by the Home Office Scientific Development Branch (Thermal Roof Markings for Police Vehicles (Vehicle Roof Markings Update), HOSDB Publication Number 43/04) but is available for all emergency service vehicles. QinetiQ, The leading Defence, Aerospace and Security experts, originally developed the Mirage™ technologies and now PVL are delighted to be able to manufacture and provide a secure single source supply of this important security product having signed an exclusive licence with QinetiQ. PVL will supply complete roof ID markings as a pre-cut kit, which can be retrospectively fitted to existing vehicles as well as new builds. 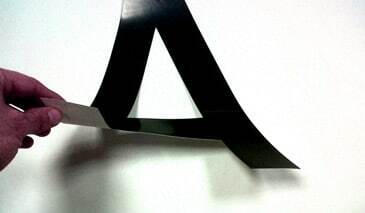 Mirage H in custom pre-cut letter/number form laminated to 7yr vehicle vinyl with self-adhesive backing. If you would like more information, please download this PDF, or contact us.